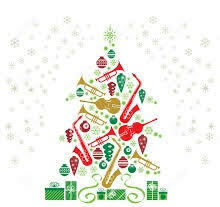 Come join us as the Award winning Savio Music Department presents their Annual Christmas Concert on Friday, Dec 12th. The concert will begin at 7:00pm in the St. Vincent de Paul Parish Activity Center at 9500 Neenah Avenue, Austin, TX 78717. The concert is FREE to the public with a food/beverage reception during the intermission. We appreciate your support of the Savio Music Department and look forward to seeing everyone there! 1 p.m — 3 p.m.
We're celebrating the next step toward the building of our Priory, a Prayer Garden, which will provide a place for visitors to immerse themselves in silence and in beauty, in order to pray and grow closer to Christ. Father Brian McMaster, pastor of St. Helen’s Catholic Church in Georgetown, will bless the Prayer Garden promptly at 1:00pm. After the blessing, guests will be invited to take a tour of the Prayer Garden, enjoy cookies, hot chocolate and cider, and hear an update on the progress of the larger planned Priory. Please register for the event so we can plan accordingly! Thank you. For more information about the prayer garden, click here. For any questions regarding this event, please call Sr. Elizabeth Ann at 512-863-4824. Mother and the Sisters hope to see you there! As we approach the end of fall and the prospect of colder weather, please familiarize yourself with St. Dominic Savio's inclement weather policies. It is the goal of the school to provide effective and timely communication with families and staff to ensure that everyone travels safely to and from school. Click HERE to view the weather policies. Grandparent's Day is this Thursday!!! 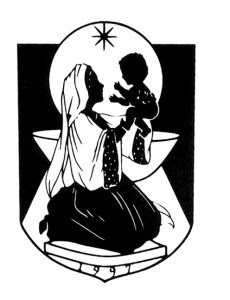 We look forward to beginning this day with Mass at St. Vincent de Paul at 10:30am. There is a reception for the grandparents following Mass in the Parish Activity Center. All are welcome to visit Savio for campus tours beginning at 1:00pm. For questions or further information, please contact the Development Office at 512.244.4861 or abrannam@saviochs.org. We look forward to welcoming many grandparents into our Savio community! 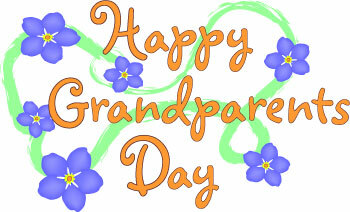 For the Grandparent's Day Schedule and more information click HERE. The St. Dominic Savio Catholic High School Music Department welcomes all to attend our "Coffee House" event on Friday November 21, 2014 from 6:00pm - 10:00pm in the Savio Commons. The Savio music students will perform in a talent show format for all to enjoy their music and acting. There will be refreshments throughout the event. Come support our Savio Music Program! The Savio Eagle boys opened their basketball season with something new--a brand new tradition played this past Saturday at the Eagle nest. The Freshmen and JV was split up evenly and they played a "Blue and White" intrasquad game with the Blue team rolling to a 50-40 win. Seven players on each team got lots of playing time and were able to show their impressive sub-varsity skills. The Eagle varsity hosted our first-ever "Alumni team" made up of seven graduate hoopsters and their player-coach, Jordan Marks. The Alumni team was made up of Quinn Robichaux (2014), Cole Korte, Daniel Minor, Michael Harrell and Chaz Anthony (2013), plus Daniel Miksch and Ricky Minor (2012). 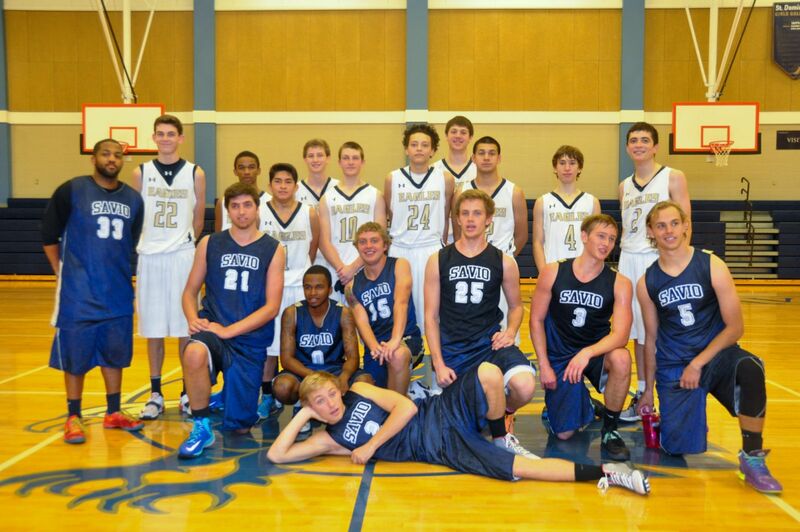 It was a great event in which this years Savio squad won a hard-fought 68-60 victory. Last night Savio opened their regular-season schedule with solid victories over Brentwood Christian. The JV trounced Brentwood 71-30 and the Varsity rolled to a 67-40 victory over the Crusaders as well. The Eagle Freshmen will have their home opener this Thursday evening at 7pm against San Juan Diego's JV and the Varsity will tip-off at home for the first time Friday night against Round Rock Christian at 6pm in a single contest. The historic 2014 St. Dominic Savio football season came to a crashing end at home on Friday as the Eagles were handily defeated by St. Stephen's 41-0. Despite the loss, the Eagle football team enjoyed its first winning season in history finishing with 5 wins and 4 losses. It was apparent from the opening kickoff that the bigger, faster Spartans would be the best foe the Eagles had faced since starting their win streak against TSD the first week of October. St. Stephen's marched through the Eagle defense in 8 plays on their first possession. The first time in many weeks any team had been able to do that against the aggressive Savio D. The Spartan offense continued its dominance over the Eagles and eventually bolted to a 20-0 lead in the first quarter and never looked back. Head coach Joe Gutilla had nothing but praise for his team. "Although the team is very disappointed in how it ended, the coaching staff is very proud, especially with our seniors who set the bar very high for all future Eagle football teams. We will get our returning players in the weight room during the off-season and get the boys prepared to make an even better run next year." Sophomore Sean Grieshop has brought home a bronze medal and several top finishes from the Fina World Cup championships. The World Cup is a series of international swim meets held across the globe. Sean represented Savio, Nitro Swimming and Team USA at two of the World Cup locations - Tokyo and Singapore. Swimmers were selected if they were among the top 75 swimmers in the world in any swimming event. Team USA took a team of 30 athletes, 6 coaches, a nutritionist and doctor to the meet. Sean left the United States for Tokyo on October 24th. Over the next ten days, he swam at least two events a day against the world's best swimmers. Team USA sent its Juniors (18 and under) to Tokyo and Singapore, but the rest of the world sent their Olympians to compete. Sean and his teammates faced legends like South Africa's Chad le Clos (the swimmer who out touched Michael Phelps in London in 2012), and the world 200 and 400 freestyle record holder Paul Biedermann. Team USA sent its Junior swimmers, the "future" of the sport, to gain international competitive experience. This young group of swimmers outperformed their coaches' expectations. Sean pulled off a 4th place finish in the 400 IM, wound up 5th in the mile, 7th in the 400 free and 8th in the 200 IM. His 4th place in the 400 IM is the 13th fastest time in American history. He earned his bronze in the 4x50 mixed relay with three other teammates. Sean returned November 3rd and on the 4th was back in school and the pool. Up next is the United States Junior Championships in December in Seattle, and of course final exams at Savio! CONGRATULATIONS SEAN! GO SAVIO !! On Saturday November 1st Savio's math team competed in the MacArthur Invitational Math and Science Meet in San Antonio. A total of twelve teams participated in the event, including six teams from big public schools in San Antonio's Northside ISD. These big schools have enrollments over 2500+ students. 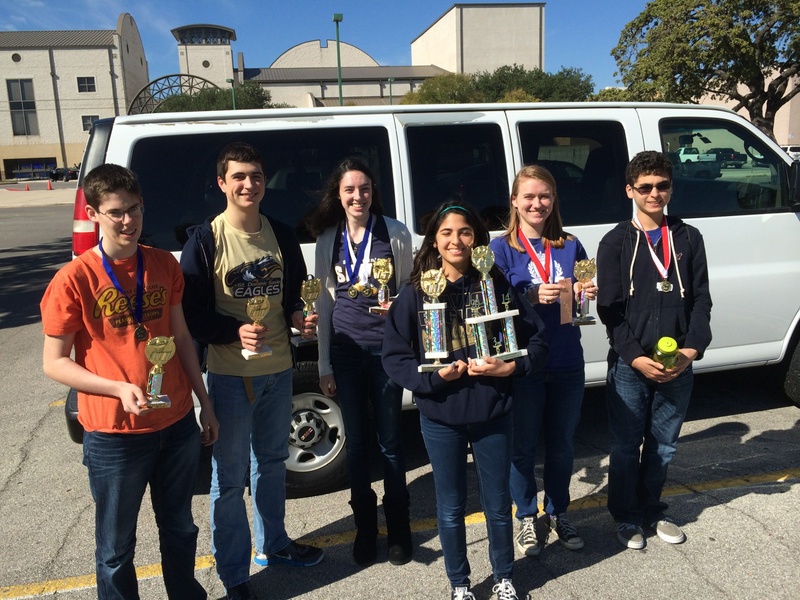 But the Savio team stood tall, taking third place in the overall sweepstakes and second place in team science score. Individual results are listed below. St. Dominic Savio rolled to its fourth straight win on Friday as they shut out San Marcos Academy 28-0 in San Marcos. The Eagles completely shut down an SMA Bears offense that had scored 60 points the previous week. Led by seniors Josh MacKay, Bradley Musabika, and Sean Casey the Savio defense held the Bears to under 150 total yards on the night. Offensively the Eagles powerful rushing attack continued to grind out yardage being led once again by senior Sam Alvarado. Alvarado rushed for 123 yards to push his season total to over 1,000 yards. Senior Spencer Supnet also had a big night running the ball. The usually ground-oriented Eagles also proved they could strike quickly through the air as junior quarterback John Richard Flores teamed up with freshman wide receiver Mark Lacayo for a touchdown, and senior wingback Brian McNaughton for a score. This Friday the Eagles will play their final game of the season at home against St. Stephen's Episcopal School on Senior Night. Game time is 7:30 at McNeil High School.